Recycled materials, creativity, and enthusiastic entrepreneurship is combining to make a fun learning opportunity for young students at Christel House South Africa. 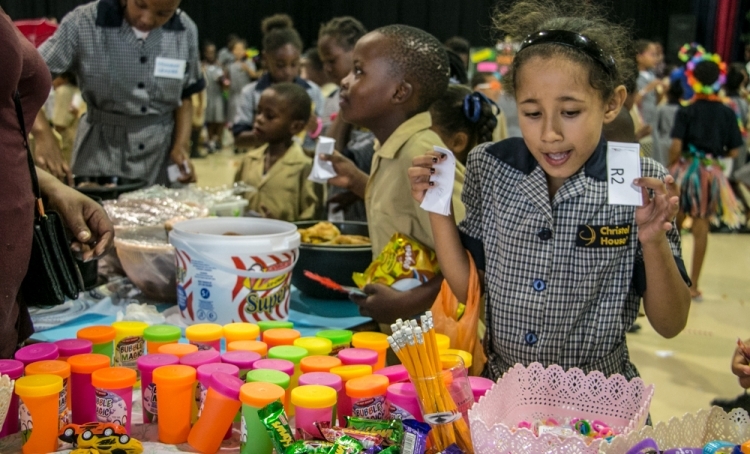 The annual Market Day event allows kids to help create and sell goods such as sweet baskets, pencil holders, place mats, and coasters. They make the items from plastic bottles, discarded CD’s, and paper towel rolls as part of their class projects. Shoppers purchase a booklet of coupons that they use as currency in the market. Profits from the day are donated to the Christel House Service Learning Program to assist preschools, nursing homes and soup kitchens in poverty-stricken neighborhoods. Students feel and see how their work is supporting others less fortunate. Teamwork, camaraderie, generosity, kindness and sharing makes Market Day a powerful learning experience.